Who says you can't have a black-tie wedding in Mexico? This California couple celebrated their Persian wedding in luxury and style at one of Cabo's most chic venues: Hotel El Ganzo. 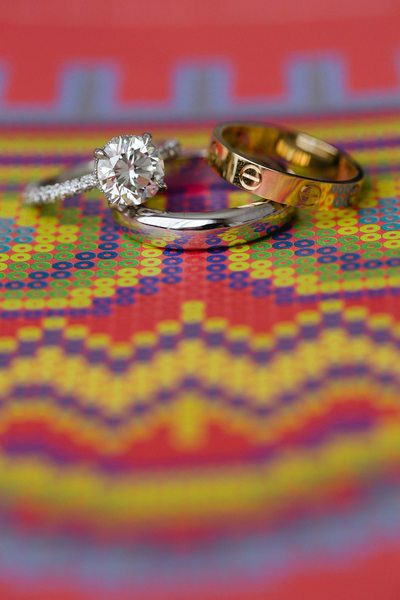 Goli and Farid's wedding mixed contemporary design with natural elements and a dash of traditional Mexican flavor! Wedding photography was one of the most important investments for this couple, and we loved that they wanted lots of time to do creative portraits that expressed their personalities and connection. El Ganzo hotel offered us lots of locations and unique lighting situations for the couple's portraits. 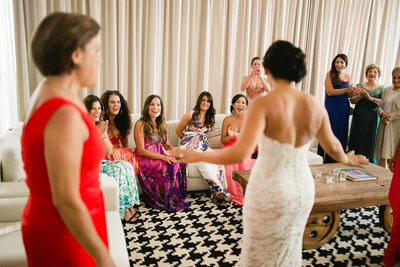 The Puerto Los Cabos wedding venue is one of our favorites in the Los Cabos, Mexico area for many practical and photographic reasons. 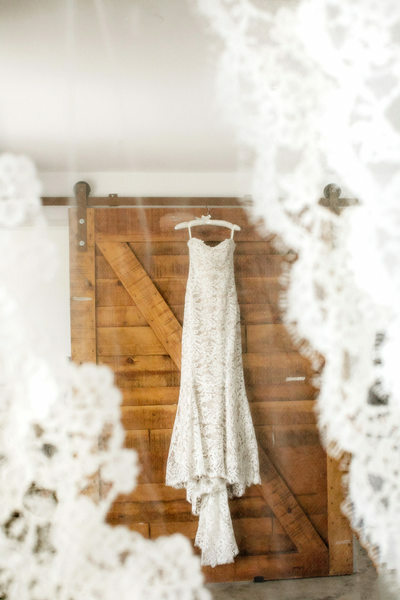 If you have a large wedding party like Goli did with (she had a champagne toast with 15 of her girlfriends after she got into her dress), The Very Large Suite on the top floor of the hotel is the ideal place to get ready. At 4882 square feet, it is perhaps the largest hotel suite in Los Cabos! It, like the rest of the hotel, has a hip design that incorporates lots of natural light, contemporary artwork, and Mexican natural materials like palo d'arco. Throughout the hotel there are many spots that offer open shade. This is extremely flattering lighting and has the bonus of keeping you cool & out of the sun. 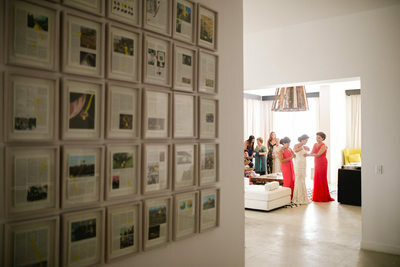 Another aspect of this top Mexico wedding venue we love is the ceremony location. Located on a grassy jetty adjacent to the beach club, it is reached via a short ride on a pontoon motor boat. Though it takes less than 3 minutes to get across the water, there is a feeling of adventure heading to the ceremony and upon arrival it feels like you are on your own private island. The long walk down the jetty is the perfect grand entrance for a bride. The Persian tradition is to have an exuberant walk down the aisle, and we loved capturing all the wedding party, family and guests expressing themselves as they did their aisle walks. Wedding venues in the greater Los Cabos area our wedding photographers have shot at include Villa Santa Cruz, Rancho Pescadero, Hotel San Cristóbal, One & Only Palmilla, Esperanza, The Resort at Pedregal, Hotel El Ganzo, Pueblo Bonito Sunset, Club Campestre, The Cape Hotel, Sunset Mona Lisa, Chileno Bay Resort, Cabo Azul, Flora Farms, Las Ventanas, Villa Bellisima, Villa Vista Ballena, JW Marriott Los Cabos, Hilton Los Cabos, Riu Palace, Riu Santa Fe, Hyatt Ziva, Pueblo Bonito Pacifica, Secrets Puerto Los Cabos, Dreams Los Cabos, Hacienda Beach Club & Residences, Sandos Finisterra, Grand Solmar, Casa Dorada, ME Cabo, Hacienda Encantada, Marquis Los Cabos, Cabo Surf Hotel, Hotel Mar Adentro, Secrets Puerto Los Cabos, Hacienda Cerritos, Las Cruces, and the Sheraton Hacienda del Mar.